Along with being dealers in some of the most sophisticated clocks and timepieces from around the world, we also hold the distinction for being an authorized service center for some of the leading clock manufacturers, such as Howard Miller, Ridgeway and Sligh. This means that our customers receive not only the best in customer service but continuing technical service support on many clocks purchased from us. Not only can we service many warranty issues for our customers but our Wisconsin clock shop also offers clock repair for the general public, including antique clocks. We have outlined a guide for some common troubleshooting problems with new clocks below. What if my mechanical clocks will not operate? Ensure that all of the packing material has been removed. If the clocks are a pendulum type, ensure that the spring clip or rubber band has been removed from the back of the movement. Try re-starting your clocks. For pendulum clocks, it is important to give the pendulum a full swing. Is the pendulum hitting the weights? If so, check the stability and level of the clocks. Do the hands operate without interference? Do not let the hour hand hit the second hand. If the second hand is rubbing the dial, pull it out slightly. If the hour hand is rubbing against the back of the minute hand, the hour hand should be pushed closer to the dial. Did you check the suspension spring? If it is not hanging straight down, loosen the thumbscrew and straighten the suspension spring. Retighten the thumbscrew. Ensure that the verge pin is properly located in the slots of the pendulum guide. For weight-driven clocks, make certain that the weights are in their proper location. The proper position of the weights as you are facing the clock is labeled on the bottom of each weight. Ensure that the clocks are wound and the weights are up. If the clocks have a moving moon, ensure that the moon is not caught on the click spring. If the clocks are cable-driven and were previously run or the white styrofoam blocks were removed from the cable pulleys, it is possible that the cables were wound up without weights left on the pulley. As a result, the cable(s) have overlapped on the drum(s). Check each cable on each drum to see if it is overlapped. Is so, attempt to correct the cables so that they are not overlapped. Correcting this problem is not covered under the warranty. What if my mechanical clocks do not strike the correct hour? If the clocks are new, allow them to operate for several hours before making any adjustments. If the strike is off, grasp the HOUR HAND ONLY and rotate it forward or backward to line up with the correct hour on the dial indicated by the number of times the hour strikes. Rotating this hand independently will not harm the movement. Then adjust the hands to the correct time by rotating the minute hand CLOCKWISE. DO NOT MOVE THE HANDS WHILE THE CLOCKS ARE CHIMING OR STRIKING. After a few hours, the movement's self-adjusting feature will synchronize the hands with the correct chime and strike. What if my mechanical clocks will not chime or strike? Make sure that the strike on/off lever is not in the "strike off" position or halfway between positions. Make sure that the movement is not in the "night off" position. Make sure that all the packing material is removed from the movement area. You should be able to carefully pull each hammer back away from the rod approximately one inch. Check the hammer adjustment to be sure that the hammers are properly aligned with the gong rods. For weight-driven clocks, make certain that the weights are in their proper location. The proper position of the weights as you are facing the clock is labeled on the bottom of each weight. If your clocks are cable-driven clocks and were previously run, it is possible that the cables were not wound up with the weights left on the pulley. When this happens, the cables overlap on the drum. Check the cables on the drums to see if they are overlapped. Correcting this problem is not covered under the warranty. What if my mechanical weight-driven chimes/hour strikes seem exceptionally fast or slow? What if my mechanical clocks are in the "night off" position and it is silent during the day instead of the night? Rotate the minute hand clockwise twelve hours. DO NOT MOVE THE HANDS WHILE THE CLOCKS ARE CHIMING OR STRIKING. DO NOT ADJUST THE CHIME HAMMER, unless the chime tone is incorrect. The chime tone may be affected by the hammer resting on the chime rod (coil) or striking the rod (coil) off center. Although the hammers were set at the factory, it is possible for the hammers to get out of adjustment. Chime hammer arms are made of brass and can be bent safely. This is accomplished by bending the hammer arms slightly in the middle so that the hammers rest approximately 1/8 inch from the chime rod. DO NOT bend the chime rod. What if my pendulum hangs crooked or hits the weights? Pendulums can easily get twisted by improper handling. To straighten the pendulum, first remove it from the clock. Use cotton gloves or a soft non-abrasive cloth when handling the pendulum. With one hand, hold the pendulum below the top strap. With the other hand, grasp the pendulum bob. Gently twist the pendulum in the direction necessary to eliminate the twist. What if the hands get bent? Clock hands are easily bent. Carefully bend them back to the correct position. Advance the minute hand clockwise until the correct time is set. When moving the hand forward, it is important to allow the clocks to chime every quarter hour (1/4, 1/2, 3/4, 1) before advancing the hands to the next quarter hour position. DO NOT MOVE THE HANDS WHILE THE CLOCKS ARE CHIMING OR STRIKING. How do I wind my clocks? Floor Clocks (cables with pulleys): weights that are suspended by cables with pulleys should be raised using the crank provided. DO NOT lift the weights by hand while cranking. Insert the crank into the holes located in the dial face. It does not matter in what order the clock weights wind. All weights need to be wound to the up position. Wall and Mantel Clocks: Insert the winding key into the holes located in the dial face. Depending upon the model of the clock, there can be 1, 2 or 3 winding holes. Turn the key clockwise until the spring becomes tight and will not turn further. For clocks with hanging weights, raise the weights using the crank. DO NOT lift the weights by hand while cranking. Wind these clocks once a week. It does not matter in what order the clock weights are wound. All springs must be fully wound. How should I prepare to move floor clocks? Care should be taken whenever you move your clocks to ensure that all accessory parts, such as weights, pendulum, ect., are removed and packed properly to prevent damage. Use cotton gloves or a soft cloth when handling the pendulum or weights. For clocks with a cable-driven movement, wind the weights all the way up. For clocks with chains, use a long wire or string and put it through the chain links just below the chain sprocket. When done properly, the wire or string should go through six chain links. Secure the wire or string to prevent the chains from coming loose from the sprocket. Carefully stop the pendulum from swinging. Remove the weights. NEVER wind the clocks without the weights installed. 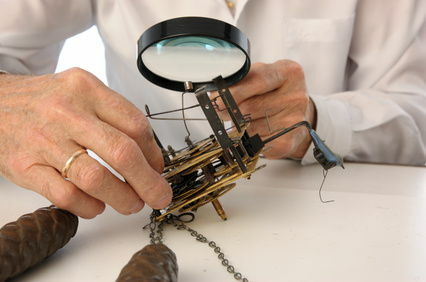 For clocks with chains, secure the chains so that they do not damage the finish. Next, remove the pendulum. For tubular movements, remove the tubes. Keep the clocks in an upright position while carefully moving it to its new location. Ensure that the pulleys are properly located on the cables and the chains are properly located on the sprockets. What is meant by "triple chime" clocks? Triple chime refers to clocks that play a choice of three different melodies. The most common triple chime melodies are Westminster, St. Michaels and Whittington. What is the proper function of the moon dial? When properly set, the moon dial tracks the lunar month and cycle of the full moon. First, ensure that brand new alkaline batteries are in place. Batteries made by various manufacturers may present some difficulty in working properly in the movement. A poor electrical connection can cause inferior performance. Ensure that the positive battery contacts are positioned over the nub on the end of the battery. The problem area is typically the negative end of the battery. Ensure that the negative battery contacts are positioned completely on the metal contact area of the battery. Where is our Wisconsin clock repair shop located? Our Wisconsin clock repair shop is located in Merton at W282 N7137 Main St.. 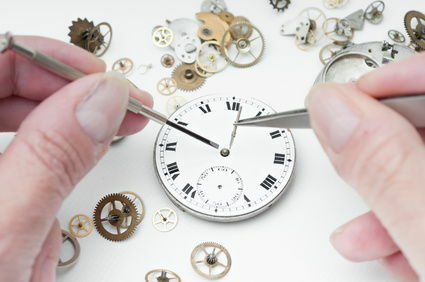 Surrounding communities for clock repair include Waukesha, Milwaukee, Pewaukee and Oconomowoc. We are a member of the National Watch Association of Watch and Clock Collectors. Pendulum will not swing: To provide proper pendulum operation, it is also necessary to ensure that the clocks are level. Also check that the pendulum is properly located on the pendulum hanger and that the speaker wires are not interfering with the pendulum operation in quartz models. Chime is off/will not chime: Ensure that the chime is not in the "OFF" position. If this does not solve the problem, replace the batteries. The clock chimes several minutes before the hour when the hands are moved manually: This is normal. The clocks will chime on the hour under normal operation.